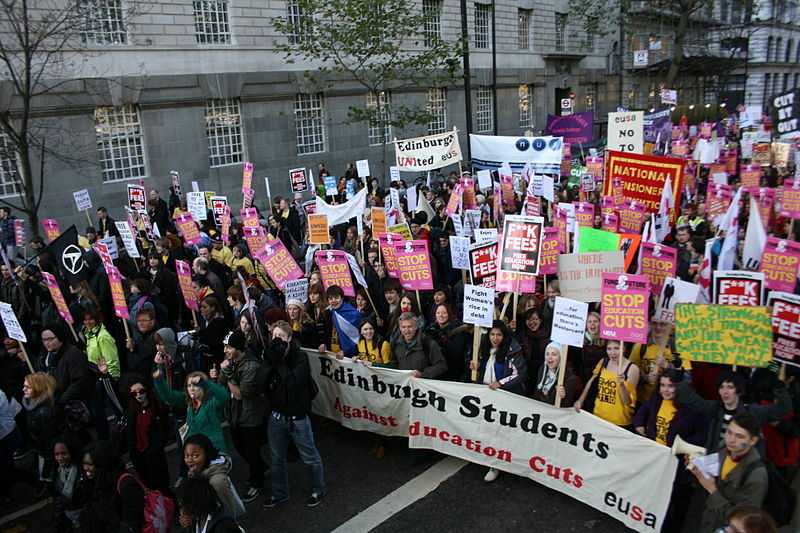 Young people in the United Kingdom stand up against tuition hikes and school closings in the face of economic austerity. On Monday, I wrote about how a disappointing Obama administration may not necessarily turn post-millennials into archconservatives. While we may have to wait a few years to see whether this prediction is right, the United Kingdom offers a mixed-bag preview for how US youth and, for that matter, anyone bearing the brunt of austerity measures might respond to a grim political and economic situation. “Youth”, however, is a category that extends well beyond students, and the rising cost of education hasn’t been the only force throwing young Brits under the bus. As Yiannis Baboulias points out in Al Jazeera, lawmakers from across the political spectrum have threatened cuts to housing and unemployment benefits for young people. The National Health Services (NHS) and education budgets have already taken considerable hits. Even as the country’s job creation is relatively stable, most new jobs pay less than £7.95 an hour. As part of a larger trend of British youth moving away from the polls, 59 percent of Brits between the ages of 17 and 21 say they won’t vote in 2015 because the majority of them don’t think politicians represent the interests of their generation. If these numbers are any indication, they’re right. While controversial, the student movement of 2010 was the catalyst for a broader anti-austerity movement that continues to this day. Massive demonstrations touched off across the U.K., with one in March 2011 swelling to 500,000. A one-day strike in November closed over 21,000 schools. While there were expected ebbs and flows in the anti-cuts movement, there have continued to be large demonstrations protesting new waves of austerity. The People’s Assembly Against Austerity convened some 50,000 people in London just last month. Last week, public sector workers took part in the largest strike action since 2011. As Decca Muldowney wrote recently, precarious workers unrepresented by unions are taking matters into their own hands with campaigns like Tres Cosas at the University of London. Where cuts have energized the left, they’ve also mobilized their opposition. The ultra-conservative U.K. Independence Party surged in the polls recently, claiming 100 seats in the most recent European elections. The U.K. example is far from ideal, but it does tell us that there are more options available to young people than simply switching party allegiance. Millennials on both sides of the pond are inheriting a world increasingly wracked by climate change and neoliberal policy—the same forces working people and, more often than not, people of color have been facing for generations. Contra Margaret Thatcher, there are many alternatives, and not all of them are in the ballot box.